Pontiac, Indian chief of the Ottawa and leader in the "Conspiracy of Pontiac" in 1763-64, was born between 1712 and 1720 probably on the Maumee river, near the mouth of the Auglaize. His father was an Ottawa, and his mother an Ojibwa. By 1755 he had become a chief of the Ottawa and a leader of the loose confederacy of the Ottawa, Potawatomi and Ojibwa. He was an ally of France and possibly commanded the Ottawa in the defeat (July 9, 1755) of General Edward Braddock. In November 1760 he met Major Robert Rogers, then on his way to occupy Michilimackinac and other forts surrendered by the French, and agreed to let the English troops pass unmolested on condition that he should be treated with respect by the British. Like other Indians he soon realized the difference between French and English rule -- that the Indians were no longer welcomed at the forts and that they would ultimately be deprived of their hunting grounds by encroaching English settlements. French hunters and traders encouraged Indian disaffection with vague promises of help from France; in 1762 an Indian "prophet" among the Delawares on the Muskingum preached a union of the Indians to expel the English; and in that year (as in 1761) there were abortive conspiracies to massacre the English garrisons of Detroit, Fort Niagara and Fort Pitt (now Pittsburg). Pontiac seems to have been chief of a magic association (the Metai), and he took advantage of the religious fervor and the general unrest among the Indians to organize in the winter of 1762-63 a simultaneous attack on the English forts to be made in May 1763 at a certain phase of the moon. On the 27th of April 1763, before a meeting near Detroit of delegates from most of the Algonquian tribes, he outlined his plans. On the 7th of May, with 60 warriors, he attempted unsuccessfully to gain admission to Detroit, which then had a garrison of about 160 under Major Henry Gladwin (1730-1791); and then besieged the fort from the 9th of May to the end of October. On the 28th of May reinforcements from Fort Niagara were ambuscaded near the mouth of the Detroit. In June the Wyandot and Potawatomi withdrew from the siege, but on the 29th of July they attacked reinforcements (280 men, including 20 of Rogers's rangers) from Fort Niagara under Captain James Dalyell (or Dalzell), who, however, gained the fort, and in spite of Gladwin's opposition on the 31st of July attacked Pontiac's camp, but was ambuscaded on Bloody Run and was killed, nearly 60 others being killed or wounded. 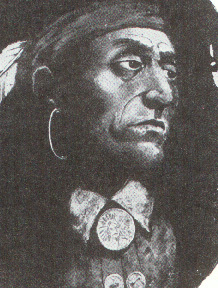 On the 12th of October the Potawatomi, Ojibwa and Wyandot made peace with the English; with the Ottawa Pontiac continued the siege until the 30th of October, when he learned from Neyon de la Valliere, commandant of Fort Chartres (among the Illinois) that he would not be aided by the French. Pontiac then withdrew to the Maumee. Fort Pitt with a garrison of 330 men under Captain Simeon Ecuyer was attacked on the 22nd of June and was besieged from the 27th of July to the 1st of August, when the Indians withdrew to meet a relief expedition of 500 men, mostly Highlanders, under Colonel Henry Bouquet (1719-1766), who had set out from Carlisle, Pennsylvania, on the 18th of July, and relieved Fort Ligonier (on the site of the borough of Ligonier, Westmorland county, PA) on the 2nd of August, but was surprised on the 5th, and fought (5th and 6th) the battle of Bushy Run (25 miles southeast of Fort Pitt), finally flanking and routing the Indians after tricking them by a feinted retreat of a part of his force. Bouquet reached Fort Pitt on the 10th of August. At Michilimackinac (Mackinac), Michigan, on the 4th of June, the Indians gained admission to the fort by a trick, killed nearly a score of the garrison and captured the remainder, including Captain George Etherington, the commander, besides several English traders, including Alexander Henry (1739-1824.) Some of the captives were seized by the Ottawa, who had taken no part in the attack; a part of these were released, and reached Montreal on the 13th of August. Seven of the prisoners kept by the Ojibwa were killed in cold blood by one of their chiefs. Fort Sandusky (on the site of Sandusky, Ohio) was taken on the 16th of May by Wyandot; and Fort St. Joseph (on the site of the present Niles, MI) was captured on the 25th of May and 11 men (out of its garrison of 14) were massacred, the others with the commandant, Ensign Schlosser, being taken to Detroit and exchanged for Indian prisoners. On the 27th of May Fort Miami (on the site of Fort Wayne, Indiana) surrendered to the Indians after its commander, Ensign Holmes, had been treacherously killed. Fort Ouiatanon (about 5 miles southwest of the present Lafayette, Indiana) and Fort Presque Isle (on the site of Erie, PA) were taken by the Indians on the 1st and 16th of June respectively; and Fort Le Boeuf (on the site of Waterford, PA) was surprised on the 18th, but its garrison escaped, and seven (out of 13) got safely to Fort Pitt. Fort Venango (near the site of the present Venango, PA) was taken and burnt about the same time by some Senecas (the only Iroquois in the conspiracy), who massacred the garrison and later burned the commander, Lieut. Gordon. About 500 Senecas on the 14th of September surprised a wagon train, escorted by 24 soldiers, from Fort Schlosser (2 miles above Niagara Falls), drove most of them over the brink of the Devil's Hole (below the cataract), and then nearly annihilated a party from Fort Niagara sent to the rescue. In 1763, although the main attacks on Detroit and Fort Pitt had failed, nearly every minor fort attacked was captured, about 200 settlers and traders were killed, and in property destroyed or plundered the English lost about �100,000, the greatest loss in men and property being in western Pennsylvania. In June 1764 Colonel John Bradstreet (1711-1774) led about 1200 men from Albany to Fort Niagara, where at a great gathering of the Indians several treaties were made in July; in August he made at Presque Isle a treaty (afterwards annulled by General Thomas Gage) with some Delaware and Shawnee chiefs; and in September made treaties (both unsatisfactory) with the Wyandot, Ottawa and Miami at Sandusky, and with various chiefs at Detroit. He sent Captain Howard to occupy the forts at Michilimackinac, Green Bay and Sault Ste. Marie, and Captain Morris up the Maumee river, where he conferred with Pontiac, and then to Fort Miami, where he narrowly escaped death at the hands of the Miami; and with his men Bradstreet returned to Oswego in November, having accomplished little of value. An expedition of 1500 men under Colonel Bouquet left Carlisle, Pennsylvania, in August, and near the site of the present Tuscarawas, Ohio, induced the Indians to release their prisoners and to stop fighting -- the practical end of the conspiracy. Pontiac himself made submission to Sir William Johnson on the 25th of July 1766 at Oswego, New York. In April 1769 he was murdered, when drunk, at Cahokia (nearly opposite St. Louis) by a Kaskaskia Indian bribed by an English trader; and he was buried near the St. Louis Fort. His death occasioned a bitter war in which a remnant of the Illinois was practically annihilated in 1770 at Starved Rock (between the present Ottawa and La Salle), Illinois, by the Potawatomi, who had been followers of Pontiac. Pontiac was one of the most remarkable men of the Indian race in American history, and was notable in particular for his power (rare among the Indians) of organization.